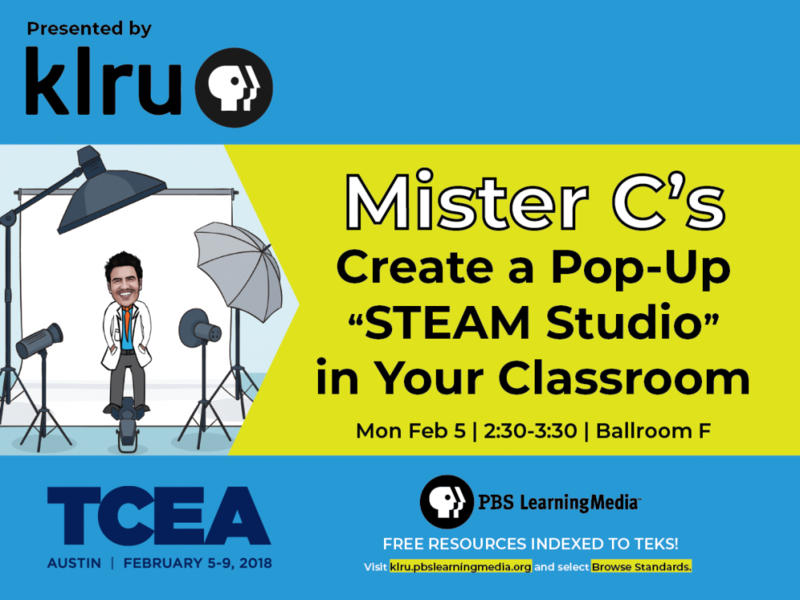 Blog Mister C’s Creating a Pop-Up STEAM Studio! Mister C’s Creating a Pop-Up STEAM Studio! The classroom has become such an amazing place to learn with so many incredible tools at the fingertips of students and teachers. Classroom boundaries no longer prevent students from accessing information on the Internet at lightning speeds. Our students go online to search for articles, videos, songs and more! The Internet is a place that provides an opportunity for online collaboration and sharing of information! That’s why it’s critical for students to learn how to create their own information and share it online in a safe and effective manner! Anytime I present at a conference – TCEA, NSTA STEM Expo, FETC, ISTE and others all across the country – I’m amazed by the information and content that students are developing with digital tools. But many times, the process and ideation are not captured for others to see and experience the learning with the students. 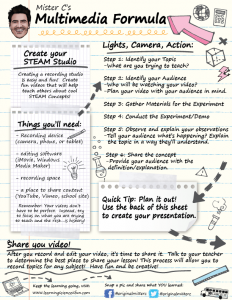 Wouldn’t it be amazing to teach students how to effectively and efficiently create media to support the projects they are currently designing? Have them build a digital portfolio, and…create content for other students to consume? That’s what creating a Pop-up Studio in your classroom is all about! Building your own studio in the classroom is relatively easy and inexpensive. There are a few things to consider, but most importantly use something that you AND your students are comfortable using. Remember, your students will become the experts in the classroom so having equipment that is conducive for them is key! Most schools and classrooms have some sort of recording device to capture media and video. My personal favorite for classroom use is an iPhone/iPod Touch/iPad because you then have instant access to iMovie in the iOS suite! If you are using a mobile device of some sort, use editing software that is native to your device. This makes editing and exporting super easy and the students can do this as part of their work flow! iPhone uses iMovie, etc. Determine where your completed videos will exist. Will they be shared to social media platforms like YouTube or Vimeo? If so, create an account that is unique and will be explicitly used for classroom media. This prevents your personal accounts from being mixed together with your school account. Additionally, it allows future subscribers to know what your channel/site is all about. I would also recommend “disabling comments” for you school videos. This prevents people from saying inappropriate things. You’re set! Most importantly, have fun and be okay with failing. It’s not going to be perfect, but it’s perfectly okay to make mistakes and produce content for others to enjoy! Click the image below to download my Multimedia Formula outline! It’s an easy way to get your students thinking about production value. Have fun and most importantly….Let’s Learn Together! Below is a video from my session at TCEA 2018 where we had some brave teacher volunteers who got in front of the camera to explore some fun science concepts. We recorded, editing and posted this only using my iPhone.